Once again from my favorite week night cookbook comes an amazing dish that is reliably accomplished in 30 minutes and is nice enough to serve at a dinner party. Chicken breasts, in my opinion, are over-rated. They became so popular during one of our many national nutrition frenzies (I think it was the grim period of fat free everything. Remember Susan Powter? Anybody? “Stop the Insanity”?) and they hung on to their popularity for reasons I don’t fully understand. They are so hard to make interesting and even harder to make well. Healthy, yes. Elegant looking, sure. But unless you cook them perfectly — PERFECTLY — they are dry and tough and need the help of copious amounts of sauce. And even if you’ve got a great sauce it’s hard to get enough of it on all of the meat to make it worth eating. This is why I became a thigh fan; it is nearly impossible to overcook them. To help cook them perfectly I will once again plug my favorite thermometer. This is the best way to ensure that the breasts are getting to the right temperature and will help avoid much of the dryness problem. 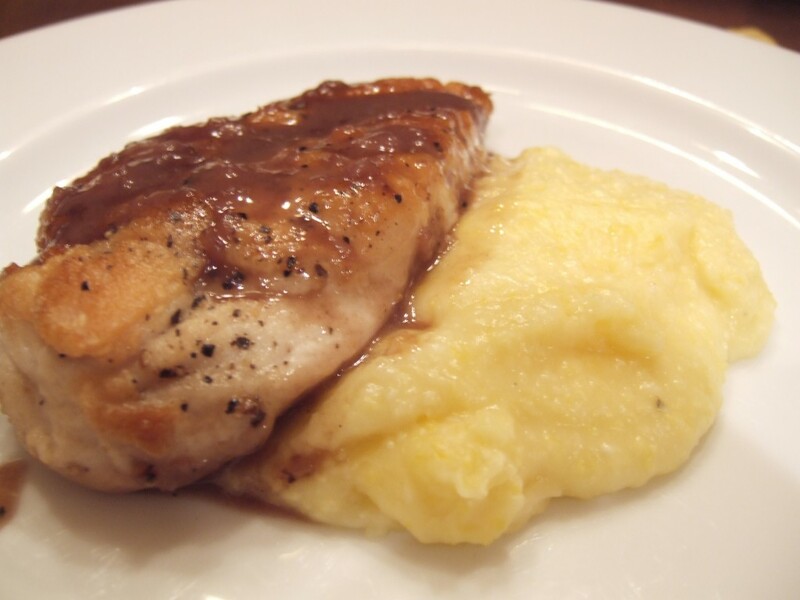 In this recipe, you will do a simple saute of the breasts and then make a pan sauce with the drippings. One thing I always do with breast halves is to pound the fat side down a little so that they are a more consistent thickness. The book gives you the basic instructions for sauteing the breasts along with seven options for the pan sauce. I originally intended to make the Warm Cherry Tomato Relish until I realized I had used up all of my Kalamata olives. 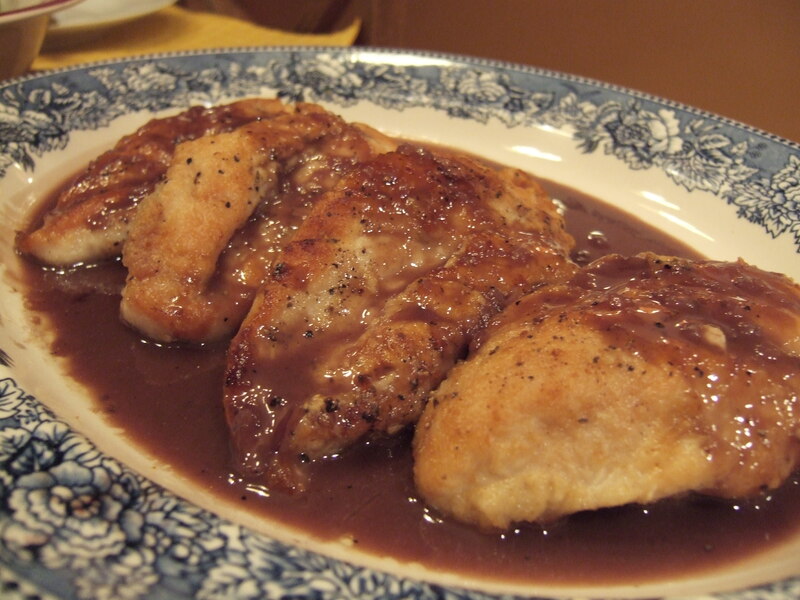 So I tried a new one: Red Wine Sauce. And, as you can guess from my last-minute switch, the ingredients are those that you, like me, might have on hand: shallot, red wine, chicken broth, brown sugar, cornstarch, butter, and thyme. The sauce was delicious but again, the best sauce in the world won’t help a chicken breast that tastes like a chamois. I served it with the Creamy Parmesan Polenta from Cook’s Illustrated. 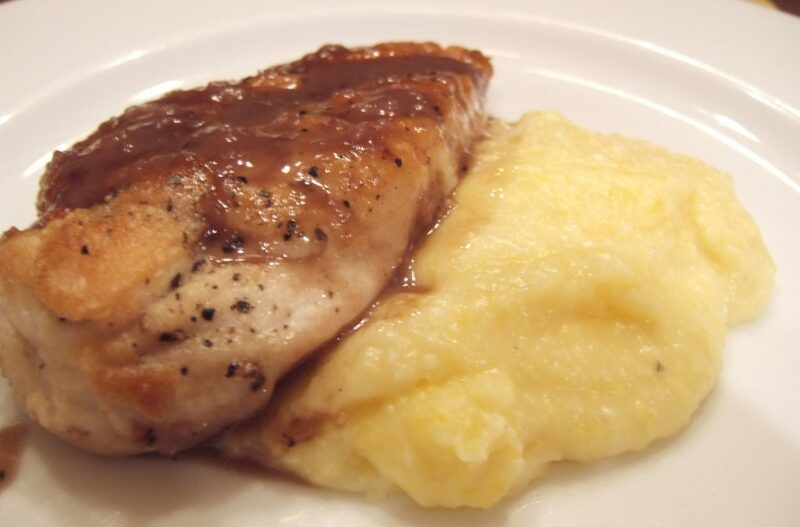 The chicken looks wonderful, but I want to roll around in that polenta. Nothing warms a body up better on a cold day. I don’t have that book, which means there is actually one cookbook I don’t own. Should I get it? I am a member of Cook’s Illustrated Online, but I don’t have the extra membership, which gives you recipes from all their books. Maybe I should do that. Mo seems like she’s a good egg! From last to first: Mo is a fantastic egg. When we make our triumphant return to NYC we will meet you. Yes, the sauce would be great on a whole leg but I wonder if the extra fat from the leg would throw off the proportions in the sauce? Not that extra fat is ever a bad thing but you know what I mean. I recommend the book without reservation. Is it actually the case that that special Cook’s Illustrated membership gives you ALL of the recipes from their books? I thought it was just a selection? You will love the Thermapen. I use it for deep-frying, bread-making, candy-making, etc. If you click on the link in my post it will take you to my Amazon Associates page. You can also use the link in my “Gadgets” tab; it will do the same thing. Thanks and get ready to lick your plate!